Greg Coombes has lived in Grafton his entire life. His interests include Cycling and Triathlons. He is a member of Grafton Cycle Club, and has completed the Grafton to Inverell 4 times. Greg is also a member of Clarence Valley Triathlon Club, Yamba and the Coffs Harbour Triathlon Club. Greg regularly competes in triathlons in all distances, from Sprint to Iron Man. 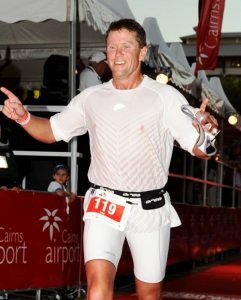 Recently, Greg completed the “Challenge Cairns” Iron Distance Triathlon, and thanks to the strapping prowess of Roxanne, he managed to complete the event in 10hrs 54min.